O Most Holy Heart of Jesus! Fountain of every blessing, I adore you, I love you. With a lively sorrow for my sins, I offer you this poor heart of mine. The following prayer to the Sacred Heart of Jesus can be said for nine days as a Novena of Confidence to the Sacred Heart. O Lord Jesus Christ, to Thy most Sacred Heart, I confide this intention (Mention your intention here). Only look upon me, then do what Thy love inspires. Let Thy Sacred Heart decide. I count on thee. I trust in Thee. I throw myself on thy mercy. O lord Jesus, Thou wilt not fail me. 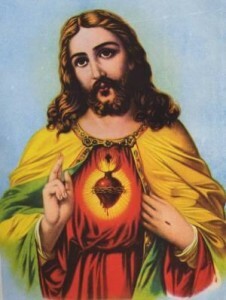 Sacred Heart of Jesus, I trust in Thee! O Sacred Heart of Jesus, I have asked Thee for many favors but I earnestly implore for this one. Take it and place it in Thine open, broken Heart. When the Eternal Father sees it covered with the mantle of Thy most precious blood, he will not refuse it. It will be no longer my prayer, but Thine, O Jesus. O Sacred Heart of Jesus, I place all my trust in Thee and let me think only of Thee. Amen.